El Corno #17 was our fourth anniversary issue. Sergio Mondragon and Margaret had just returned from a U.S. reading tour, and had seen first-hand how important the journal was to generations of young poets. 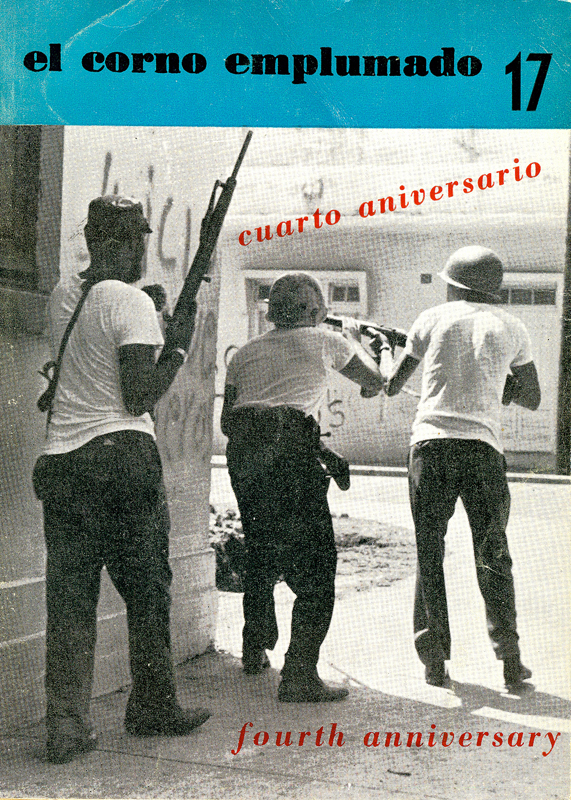 This issue’s cover bore a photograph by Mexico’s Rodrigo Moya, showing U.S. Marines in the streets of Santo Domingo. Images of U.S. presence in other countries weren’t frequent in the corporate press, and this was a dramatic picture. Among the poets whose work we featured is this issue were Jerome Rothenberg, Anselm Hollo, Clayton Eshleman, J. Mario, Alejandra Pizarnik, Walter Lowenfels, Keith Wilson, Diane Wakoski, Elise Cowen, Lionel Kearns, Jack Marshall, George Economou, Rochelle Owens, Carol Berge, Robert Kelly, and Allen Ginsberg. There was art by Pedro Alcantara, Betelu, and Beate Wheeler among others. Our letter section, which had become one of the journal’s most awaited features, included missives from Ernesto Cardenal, Theodore Enslin, Charles Bukowski, and Carlos Pellicer.